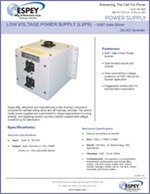 The Espey Tactical Power Supply provides regulated 28VDC power from any AC power source in the range of 100-253VAC, 47-420 Hz. 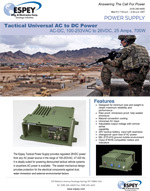 It is ideally suited for powering dismounted tactical vehicle systems in anywhere AC power is available. 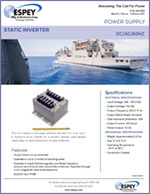 The sealed mechanical design provides protection for the electrical components against dust, water immersion and external environmental factors.